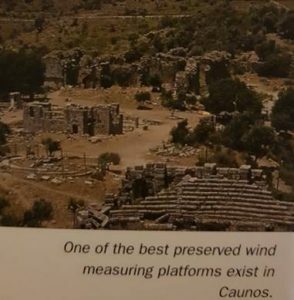 Caunos is not a large archaeological site, despite its being mentioned in ancient sources, but at its heart it shelters many mysteries that have been revealed to some archaeologists for the very first time. Every stone visible amongst the thick undergrowth and the remains of every structure tell the story of past ages to those who wish to understand and be acquainted with it. From the mountains to the Delta extending out to the sea, this panorama of natural history unfolding is one from which dreams are made. 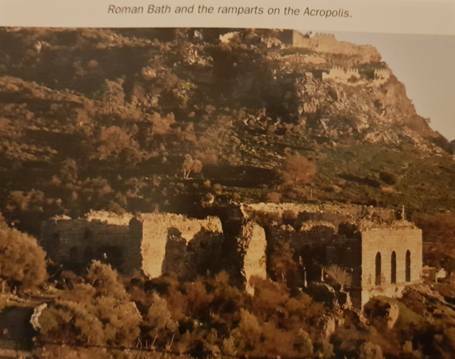 The Acropolis lies on a steep crag, approximately 152 metres high dominating the city and its surroundings, including the small fortress on the headland that is an extension of its defence and cult centre. The settlement in the Archaic and Early Classical periods (from the beginning of 700-500 BCI was located within the basin between the archaic defence walls laid with large partly hewn stones that ringed the city from the south and southeast over the backs of the acropolis and small fortress. 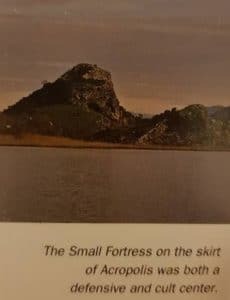 The small fortress protected by ramparts and towers was at that time a promontory extending to the sea, and the bays, both on the south and on the north, were the ports of Caunos. 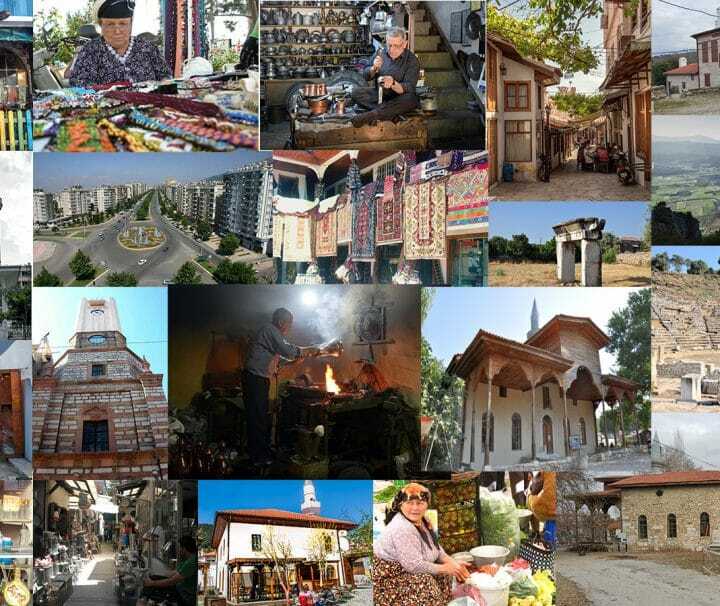 The topography of the city rises with a fairly steep slope towards the foot of the Baliklar and Sivrihisar mountains, a continuation of the Olemez Mountain, after a narrow strip of plain in front of Sülüklü Lake (the old inner harbour). From the second half of the 4th century BC, by building large embankment walls, these slopes were made into terraces rising step by step, and the city spread and expanded over them. In later periods their use was continued, repairing these terraces or broadening them with additions. This city planning, influenced by Persepolis, was also used at Halicarnassus and Rhodes during the period of Mausolus. The best preserved ruins that illustrate the heyday of Caunos’ past from the 2nd half of the 4th century BC, are its long ramparts and rock tombs facing the temple. 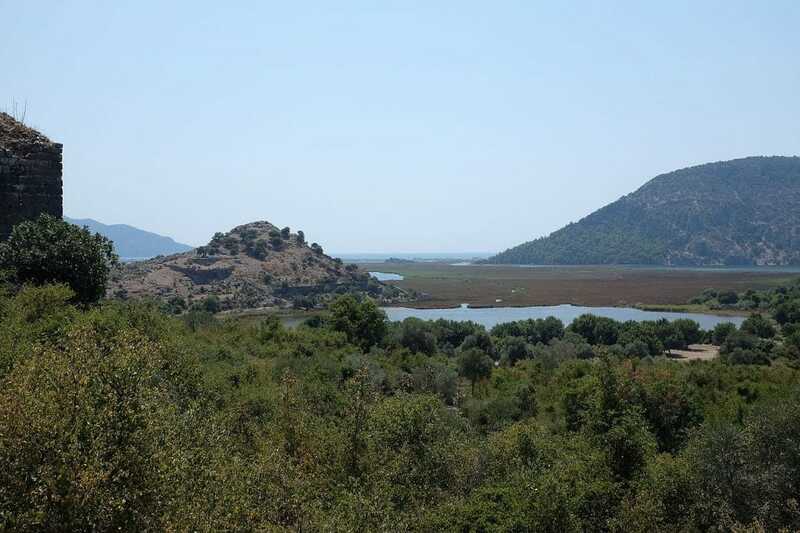 The long walls dating from 4th century BC that have in places remained standing in entirety, begin from the west of the harbour, and following Caunos’s north-west and north ridges stretch to the steep cliffs opposite the town of Dalyan. The distinctive details of workmanship on some parts of the ramparts show the repairs made at various periods, or that the parts that were badly damaged were taken down and rebuilt. Based on the stonemasonry, the north and northwest walls and the bastions that support them are thought to have been built in the time of Mausolus (360-350 BC). 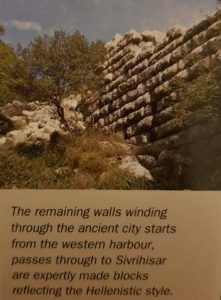 Starting from the west of the inner harbour passing over Sivrihisar, the evenly dressed rectangular blocks and the polygonal laying technique in the rampart wall show the characteristics of the Hellenistic period. The answer to the question why the walls surrounded such a large area in proportion to the size of the city of Caunos and its population, and why these walls that were so difficult to defend were made so long, is Mausolus’s great dreams. This Persian governor, who had almost as much authority as a king, had thought of developing the small Leleg town of Mydos on the Bodrum peninsula, and had surrounded the proportionately tiny settlement with ramparts. 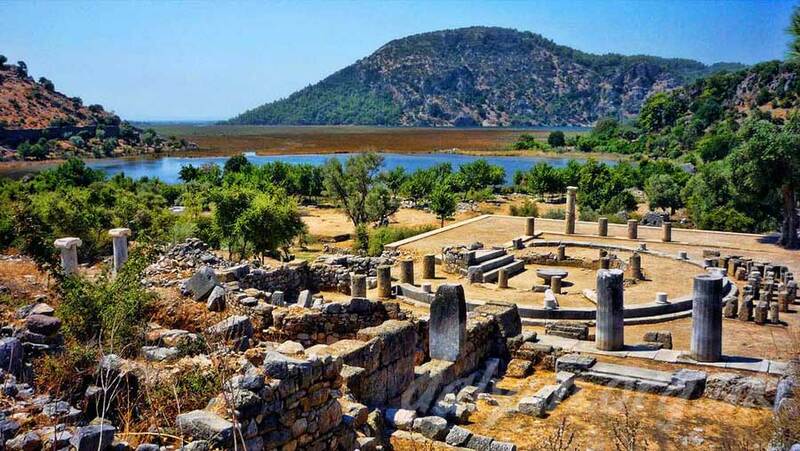 It is known that Mausolus created new taxes and even tried to tax long hair, the proud possession of the Lycian men, in order provide the funds for this huge building project. Without doubt Mausolus had realized the strategic importance that Caunos, with its productive agricultural areas extending to the hinterland and being right opposite Rhodes, carried as a military and trading port. He had probably planned to develop Caunos and use it as a base to control Lycia. The two pedestals belonging to the bronze statues of Mausolus and his father Hekatomnus were taken out of the sacred site of Caunos and were presented to Apollo, to show the gratitude and respect that the people of Caunos felt for Carian governor who gave special importance to their city. 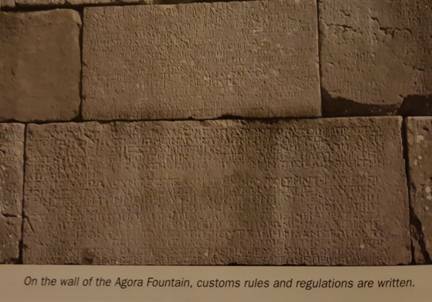 On the subject of the long walls and the difficulty in defending them, an interesting historical event took place when the city was seized by the Ptolemaic dynasty. The Egyptian General Pholokhes, with a stratagem of war, bribed the staff who were given the task of doling out Caunos’s grain and, asking them to announce to the soldiers that the grain was going to be given to them in the city and not at the places where they were stationed. His army easily climbed over the walls that were undefended because the soldiers had left their posts, and took the city. north, northwest and west sides is a narrow path that starts from the slope to the east of the theatre. A small niche with a pediment hollowed out of the rock on the right immediately at the beginning of the path, shows that the acropolis was at the same time a cult area in the First Age. The hill has been arranged in terraces towards the summit. Remains of garrison buildings and a small church can be found on the first of these terraces In the area starting immediately below the summit of the hill and extending westwards are the walls laid in the form of a polygon. The terrace of the fortress of the First Age and Byzantine ramparts were built on these. 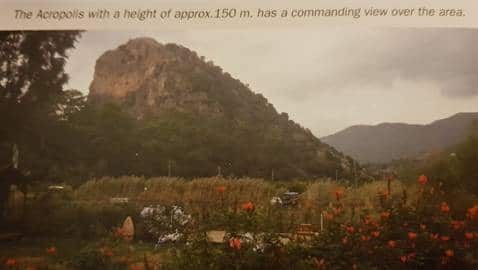 This rocky hill, at a height of 50 metres, that is an extension of the Acropolis was a peninsula extending to the sea until the 5th century BC. The hill dominating the harbours on both sides was divided in two by the archaic ramparts that ran along the ridge between the Acropolis, the defence and observation towers each built on the top of the two promontories at the end of the peninsula at later periods and were linked to this rampart with walls. The ramparts and buildings on the small fortress have survived to this day in an extremely ruinous state, and detailed archaeological research has, as yet, not been carried out. However, the existing traces and the boundary walls belonging to the two large terraces for religious use, show that the small fortress was an important religious centre for Caunos, as well as being in a strategic position for defending the harbours. The first terrace was obtained by planning the rocky surface in the direction of the hill’s acropolis and was a flat area measuring 80×30 metres, its periphery supported by walls. There are no remains of a building. However there is a ridge of the main rock left in the middle as an altar and because of the ceramic votive pieces unearthed in the excavations surrounding it, the head of the excavation committee is of the view that, ‘This special place must be thought of as a sacred area predominating over the region, rather than just temple (Ögun, Işık- 2001). On the northwest slope where the small fortress sits, there is a second terrace that leans against the rampart wall on the southeast and is supported by three walls. From an iconographic perspective the myriad and sundry earthenware artefacts found all mixed up in a heap directly in front of the terrace wall, must mean that they were icons used in worship rituals belonging to the cult of Demeter (the goddess of agriculture) and her daughter Persephone. These finds date back to the 4th century BC, indicating that the northeast terrace was built at the same time, with the temple of Demeter on top and hypogeum* underneath. 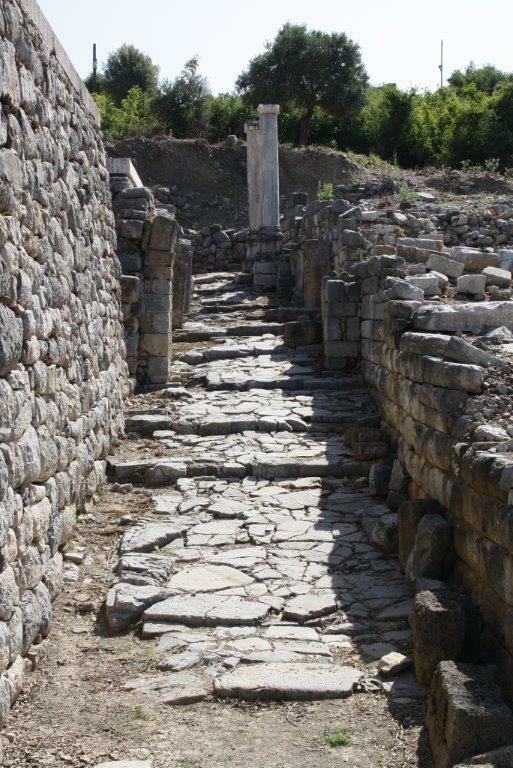 A square podium of three steps was unearthed in the excavations made in 1972 on the narrow level strip between the small fortress and the inner harbour. This beautiful building made of marble was probably destroyed by a strong earthquake as the upper structure was piled up in the southwest corner. 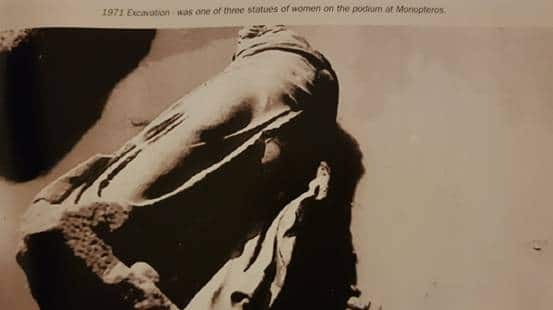 Three overturned statues of women on the steps of the podium indicates that a herm was surrounded by these statues. Today in Koycegiz square, you can see a statue of a lion taken by treasure hunters from the plinths on the southwest side of the Monopteros. Using only the architectural remains for reconstruction, it was ascertained that the site was arranged in the form of a circle on a square floor, having eight smooth columns which rose up to Ionic capitals, and that the roof, which was entirely made of marble, had spouts in the form of a panthers’ heads. It can also be deduced that the Monopteros with acroteria’ was of a compressed conical shape. 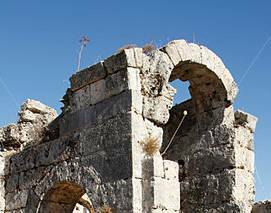 It is not known for what purpose the Monopteros, dating to the 5th century BC was built. This structure might have been constructed in a more Roman style tradition using the typical circular monuments and ornamentation. 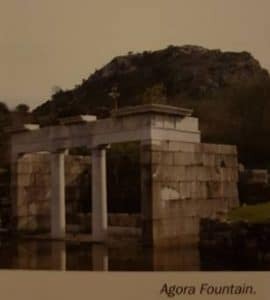 But if Caunos can be considered a representative of the Anatolian tradition of building mausoleums that reached a peak with Mausolos himself, perhaps Monopteros is a tomb structure or hereon’, in other words, a symbolic mausoleum. 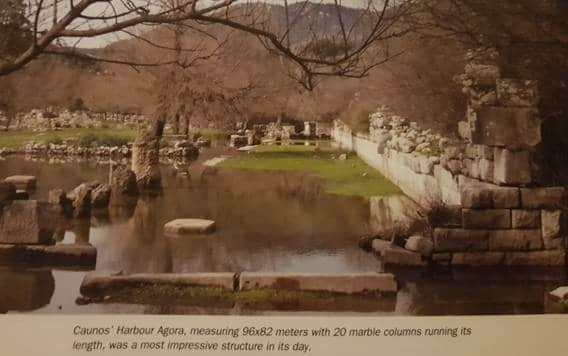 Leaving the Monopteros and beginning at the quay beside the fishing weir facilities and coming onto the road that brings one to the ruins, then passing the archaic ramparts, you will see the harbour Agora, the centre of the city’s economic, political and cultural life. Also, the Agora fountain, called a Nympheon with reference to nymphs, that is located in its northeast corner. These monumental fountains in city centres were essential in the First Era, for both supplying water and providing a relaxing atmosphere from the cool, gurgling sounds emitted from the water channels. George Bean, in his observations at Caunos, was confronted with a long inscription relating to customs duties and discounts on some stone blocks that had fallen down, and were scattered amongst the bushes. With this peace of information, he determined that the ruin belonged to a customs building. When Turkish archaeologists restored the building in 1969, it became definite that it wasa fountain dating to the Hellenistic period. The fountain built with rectangular limestone blocks had been placed in front of the terrace wall and had alterations made during the Roman period. The fountain was of a rectangular plan with the back and sides surrounded by a wall, having two pillars placed on the façade facing the Agora. Half the inner area had been divided by stone slabs and made into a cistern where a step in front of the slabs made it easy for people to dip their pitchers into the pool and to fill them. The roof covering the fountain had been positioned on architrave blocks, walled on the three sides with frontal pillars providing shade and shelter from the rain. Surplus water flowing out to the gully from the back wall and filling the pool was sent via an escape pipe to the drain. The Agora fountain was a plain, utilitarian structure. However, what made it unique was the content of the inscription that filled the façade facing the port. This inscription dating to the first years of Hadrian’s reign announced that customs discounts would be afforded to merchants and boat owners, while an exemption from tax for those who wished to buy boats from the boatyard, as well for those who wished to get their boats overhauled and repaired. This declaration had the aim to restore sea trade at Caunos when the entering and exiting of boats had become difficult, due to the delta formation that had begun to silt up the harbour. Another noteworthy point was it stating that two citizens of Caunos had donated 60 thousand denarii to meet the losses that the city’s budget would sustain due to this implementation. 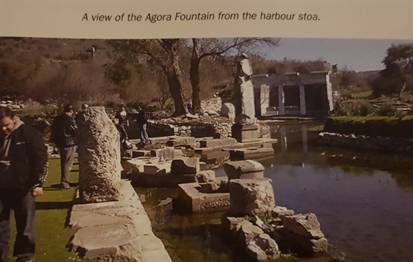 The harbour Agora in Caunos is between the fountain building and stoa on the level area at the edge of Sülüklü Lake. 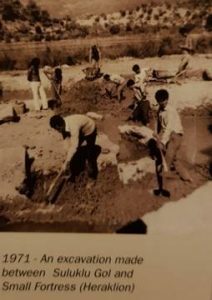 Excavations have continued there since 1969, and have revealed that the first settlement began in 5th century BC; however, the Agora was established in 4th century BC and was used until the end of the Roman period. The Agora was the heart of the city’s social and economic life, but was at the same time, the city’s cultural and historical mall. 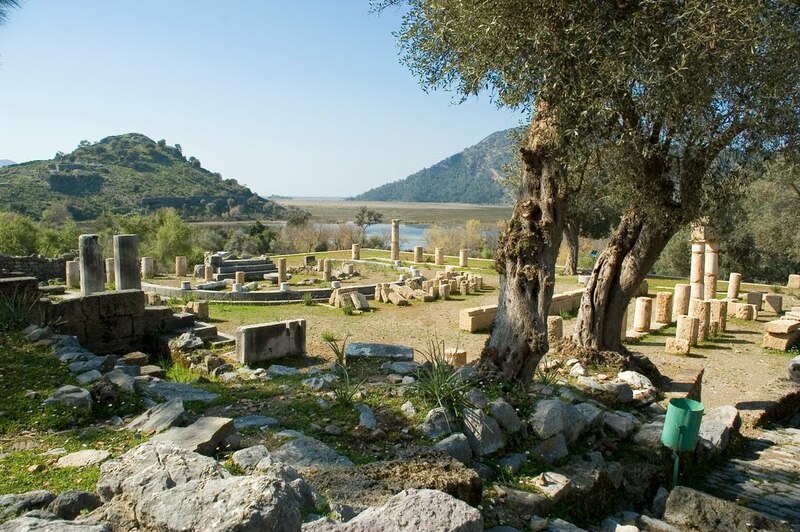 Most of the obelisks and plinths unearthed from the Agora have inscriptions on them which reveal important information concerning the events, people associated with those events and prominent families of Caunos’ ancient past. Despite finding a great many rectangular plinths all belonging to ar shape, on which groups of statues were aligned, no statue or a piece of a statue has been found. This puzzling detail is solved by the smelting furnace dating to the Byzantine period found near the plinth of the bronze equestrian statue of Lucius, Licinius Murena, who governed the Asian province in the time of the Republic of Rome of Rome. As it is today, bronze in that period was a costly brass alloy. Caunos had already begun to go into decline both culturally and economically, and in the Late Byzantine period, the Agora was abandoned by the people, escaping from mosquitoes to live in the higher areas of the city. In this period, the statues most of which had been destroyed by earthquakes and neglect, were probably separated into pieces and transformed into bronze ingots and sold. The Agora’s stoa with its long rectangular plan and columns made of limestone was probably plastered and painted, making a plain but impressively large edifice. The stoa dominated the Agora for centuries, protecting the citizens of Caunos from the sun and rain and without a doubt set the scene for long bargaining sessions among merchants and brokers, as well as heated debates on politics and city issues. A sacred chamber was built for goddess Aphrodite Euploia, who bestowed her blessings on the seamen. 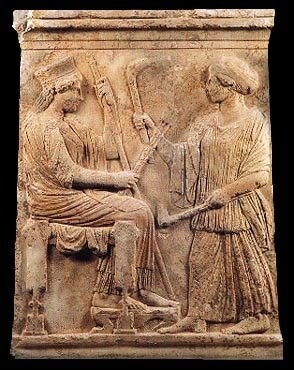 This shows her important role among the Carian people. The Greek goddess of love, born from the white foam of the sea, formed like a pearl mounted on an oyster shell, landed on the shores of the Isle of Cypress and came to be worshipped at Caunos with the name ‘Aphrodite Euploia.’ In the customs regulations on the wall of the Agora fountain, it states that a special tax was levied for the goddess’ temple, its importance underscored as it was excluded from exemption. Temples had been built for the goddess near the inner harbour, perhaps ever since the oldest Archaic period, in the belief that she protected sailors and that she brought them luck and profit. Found among some temple remains dating back to the 4th century BC, were numerous earthenware figurines now known to be artefacts belonging to the Aphrodite cult. While the stoa was being built in the third century BC, the older temple had been buried by the stoa and perhaps the cult had been neglected for a few hundred years. However, in the Early Roman period, the citizens of Caunos built a new chamber of worship next to the back façade of the stoa, in the name of the goddess they could not forget and they pulled down part of the stoa wall and opened a door to this chamber. The floor of this rectangular chamber was made from re-used stones, laid with lime plaster, and covered with marble slabs. The surroundings of the podium in the middle of the back wall was also covered with marble. 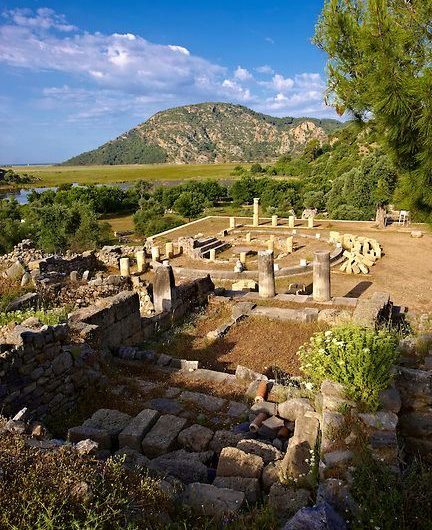 A cylindrical altar found in pieces during excavations has confirmed the view that the chamber was the place of worship of the Aphrodite Euploia cult. The altar made of good quality white marble was expertly carved to represent Zeus, the king of the gods standing with his sceptre in his hand and the goddess Aphrodite holding her son, the baby Eros, in her arms. Today, this vestige of Caunos’ sacred past is on display at the Bodrum Museum (Öğün, Işık -2001). There were certain risks taken in order to build this chamber of devotees of Aphrodite Euploia, one of which was the dismantling of the original plans for the stoa for those wishing to revive the cult of their goddess in the Early Roman period. Perhaps the political structure of the time lent itself to the bias of this once profoundly important deity. The Romans believed that Aeneas, the son of the goddess left the city with his family while the Mycenaean federation seized and burnt Troy and came to Italy founding Rome. The people of Caunos might have hoped to obtain some privileges from Rome by strengthening and exalting the cult of the goddess that already existed in their city with a beautiful, new, chamber. Every stone visible amongst the thick undergrowth and the remains of every structure tell the story of past ages to those who wish to understand and be acquainted with it. The raised main rock that stretches down from the Palaestra Terrace onto the level ground of the Agora behind the south façade of the stoa like a tongue, was declared a sacred site for Lycia’s “god of light” Apollo and his twin sister “the huntress Artemis circa 5th century BC. This big project as probably prepared and financed by Mausolos. The rocky surface was smoothed down as much as possible, the hollows were filled and the level area was reinforced with terrace walls. The most important building paying tribute to Apollo was the structure built for sacred feasts Although repairs and alterations were made in later periods, the original plan was between the two terrace walls and the platform in front, mounted with one step and the slim, long, rectangular building behind it with measurements 30, 10 x10, 70 metres. This main area was divided into 5 rooms. With two small rooms at either end the three rooms in the middle were square, but the doors were not in the centre of the room. These large rooms immediately remind us of an andron *, arranged in houses or official buildings for meetings and feasts and attended by only free and noble men, these rooms were made in measurements to be encircled by only an odd number of klinai for eating in a reclining position. The square rooms of the feast building of the Apollo sacred area are in measure ments that allow 11 klinais to be installed. (Öğün, Işık -2001). The rocky temenos area (southwest of the sacred feasting hall) was situated on a wide terrace with boundering walls that had been filled in and smoothed out. The small chamber obtained by building a wall in the hollow opening in the middle of the terrace was, probably a pool used for purification ceremonies The statuette of the Caunos’ Artemis fashioned from limestone which was removed from this secret chamber or pool, confirms the idea that she too was worshipped at the sacred site, along with Leto’s twin children Apollo and Artemis, as at Xanthos. The large number of tablets, statue plinths and some valuable votive statuettes made of bronze, excavated from the temenos important finds that determine the importance that the Apollo-Artemis sacred arca carried in the religious life of Caunos. The most important bronze statues of which only the plinths have survived, bear the names of Mausolus and his father Hekatomnos There is also the semicircular exedra, the work of most famous artist the fresco painter and sculptor, Protogenes who Caunos nurtured, on which the statues of he himself, his mother, father and two of his friends were placed. 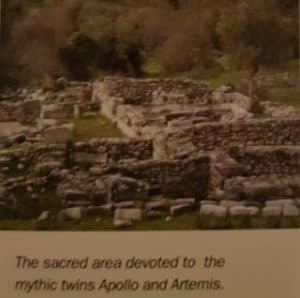 The most sacred of the sacred places at Caunos was on the second terrace at the corner of the main road, past the Apollo-Artemis site where the steps lead up to the Palaestra terrace. Built in the name of the ‘Saviour God’, this temple was a simple in-antis structure, surrounded by a gallery of columns in the Doric style with two columns at the façade and a podium accessed by going up two steps. The temple built with re-used materials dates to the third century BC. According to the leader of the excavation, the inscription, ‘Saviour God’, written on a column tambour, represents the chief god Zeus or a local god Basileus Caunos. (Öğün, Işık – 2001). Opposite the entrance to the temple is a circular structure surrounded by two rows of columns, one within the other. Within the center of this interesting building was a large altar dating back to the 1st century BC. Traces of railing panels between the outer columns were salvaged, and spaces between the inner columns revealed a walled-in closure. The function of the circular structure has long been the subject of debate. After a drilling excavation produced a large, slight shaped stone obelisk (protected by a sort of well wall), it was determined that it was the symbol of the god-king Caunos believed to be the founder of the city and its protector. This obelisk’s symbol carried enough importance to be stamped on the city’s coins, and although heavily protected, its fate was to be buried centuries of earthly rubble sliding down u incurring a break through its center. The people of Caunos had first built a well wall around their sacred symbol to protect it and had continued to offer their sacrifices. Later, when the cult center grew in importance, the circular structure was built next to the temple which secured the obelisk. The most sacred of sacred places, comprised of a circle within a circle, surrounded by columns, with a central altar that once held an important obelisk that was recently discovered broken in two. The remains of three important buildings stands on Palaestra Terrace; Roman Bath, the Domed Basilica and the Measuring Platform. Research conducted on the Palaestra terrace reveals that the large flat area was formerly a settlement and perhaps sacred site goin back to the archaic period. While the terrace was being built for the Roman bath, along with the Palaestra’s stoa, which was part of it, the old city belonging to a previous period, was buried in its entirety underneath. What remains today are the Roman bath, the domed basilica, and the measuring platform, which lies between the theatre and the basilica. The Roman Empire was known to emphasize its might by building titanic structures and majestic engineering designs. Even in the most remote corners of the Empire, donations from senators and emperors were used to develop large bath-palaestra complexes to spread the Roman culture and the life style. The palaestra consists of the training halls and dressing rooms behind the columned galleries surrounding the three sides of the building and the sports field in the courtyard in the middle of the galleries. Its connection to the bath is provided through the monumental gate on the fourth façade. The Caunos Roman bath complex was built according to the standard plan of the era. Passage from the palaestra’s stoa (of which only the foundation remains), to the multi-purpose rooms (ambulancium) at the two sides of the bath, that has remained intact, which were used for sports and meetings, is through two doors at the two sides. The washing areas of the bath, which was heated from the bottom by hot air and steam coming from the furnace, consisted of the cold area (laconicum], the warm areas at the two sides (tepidarium) and the hottest part at the far end caldarium). The baths functioned not only as a social club, but as an intellectual forum and physical training ground. Located on the uppermost terrace of the Acropolis, it was virtually the stamp of the Roman Empire onto the city of Caunos. Due to its monumental size and quantity of remains, the baths along with the theatre are the most impressive of all ruins. 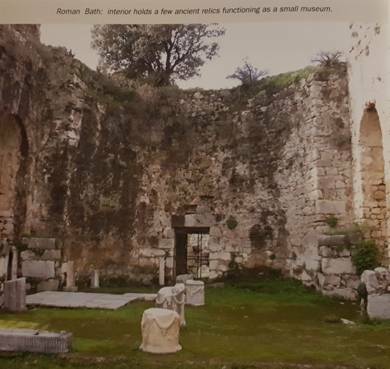 Evidently, the baths were dismantled by the Byzantine period with complete destruction of the palaestra; the frigidarium was reconfigured and functioned as a church for a while before the calidarium’s entire heating system was unearthed during an interior renovation (Öğün Işık-2001). The Domed Basilica: built in the Byzantine era with materials gathered from pre-existing structures. The Byzantine church situated in the middle of the Palacstra Terrace and dating back to the 5th century was completelybuilt of materials gathered from existing buildings. The church, which was built on the foundation and terrace of a pre-existing structure circa 4th century AD, was most probably a sacred site had three naves. Entrance to the naves were through three small doors at two sides. The ceilings were vaulted and a small dome was placed in the middle of the central nave; chapels with domes were later added to the two sides of the east end of the church, access to which was both from outside and from the inside of the church. The palaestra basilica, the interior of which is believed to have been covered with plaster and decorated with frescoes, is the only ilding of the Byzantine era in Caunos that still stands. In his work entitled “10 Books on Architecture”, the famous Roman architect Vitrivius, who lived during the Augustan age, mentions wind measuring platforms used in city planning. It is a fact that a continuous circulation of air provided by avenues and streets directed according to prevailing winds, would keep the city’s air clean. The circular building with three steps located at the end of the Palaestra Terrance and on the space between the basilica and the theatre is recognized asa well-preserved example of the wind measuring platforms that we can be discerned only through the descriptions mentioned in ancient texts. The base diameter of the circular building that is dated back to about 150 BC is 15,80 metres while the top diameter is 13,70 metres. It is believed that a tapered obelisk that is seen in pieces very close to it may have been mounted on the platform in the original plan, lending the structure monumental proportions that could be seen far and wide (Ögün, Işık – 2001). The thin lines that start at the base blocks of the platform and divide the structure into 16 equal parts are the four cardinal points lesser points becoming more complex as they reach upwards towards a well-honed top step to be used for calculations of wind measurements. Unfortunately, the circular building collapsed probably due to an earthquake and the steps were taken to construct the Byzantine edifice close by prevents us from understanding what methods were employed to measure the winds. 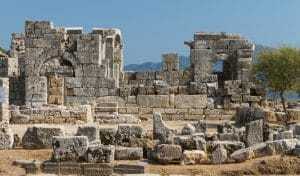 building of Caunos that still stands and because it carries both Hellenistic and Roman features. Because, the south half of the cavea was dug into the slope, the orchestra is a bit wider than a semicircle and the seats beginning from the orchestra floor are Hellenistic characteristics. In contrast, the analemma walls on which almost half of the cavea is placed are products of Roman engineering. 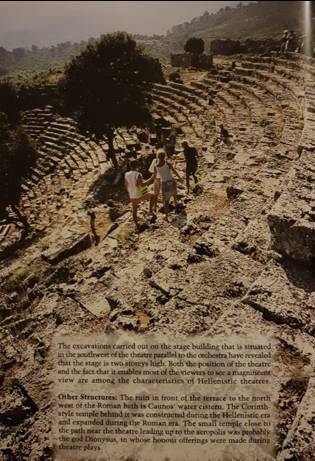 For this reason it s possible to assume that the theatre was constructed during the Hellenistic period and was enlarged with radical changes during the Roman period while retaining Anatolian architectural traditions in its project. The theatre could hold up to 5,000 people with 18 rows of seats below the diazoma and 16 rows above it. The orchestra and the cavea are accessed from the parodoi at the two sides of the stage building. The two vaulted corridors opening over the analemma wall take spectators directly to the diozoma. In keeping with its long history, believed to go back to the 10th century BC, Caunos is surrounded with a wide variety of necropoleis. In Greek/Roman tradition the dead are never buried within inhabited areas; the graveyards called necropoleis, that is “cities of the dead”, were built outside the city walls and along the roads. The “Hereons” found within the cities and at central locations were graves of very important people and were mostly symbolic. Outside the western gate over the archaic wall was perhaps Caunos oldest necropolis. While the port to the north of the small castle filled up and turned into land, its shores were used as graveyards Over time the rocky coastal area became farmland when the alluvial fills took over, and the area north of the Acropolis was engulfed by cemeteries. The most distinctive feature of these large necropoleis is in the variety of types found. 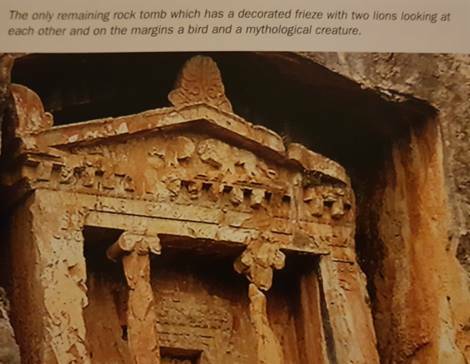 Without a doubt, the most important category within tomb architecture is the temple-faced rock tombs that display characteristics specific to Caunos and its vicinity. The “pigconhole” type tombs, consisting of a rectangler niche entrance, in which the ash of the dead were placed in urns, are the most prevalent throughout the necropolis. 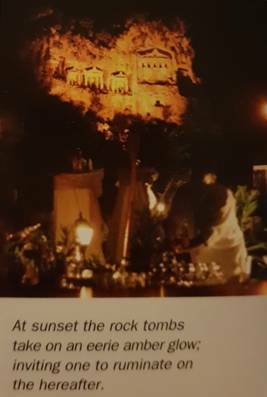 However, the sarcophagi cut into the rock and covered with stone may also be listed among rock tombs. Box tombs can be classified as a more plebian, family style grave where the holes are lined with interior walls that are covered with flat stones and arranged side by side. According to antique customs, the dead would be buried in their best clothes and jewellery and the relatives would leave gifts inside the grave. For this reason necropoleis were frequently raided and the tomb raiders demolished anything they felt had no value, thus destroying historical artefacts. In the Middle Ages, Christianity changed many customs including burial rituals, such as the leaving of gifts in graves. While the doctrine of monotheistic religions concerning reward through heaven or punishment through hell in the afterlife heavily influenced the community’s need for repentance and absolution of guilt, the churches started to be surrounded by graveyards. 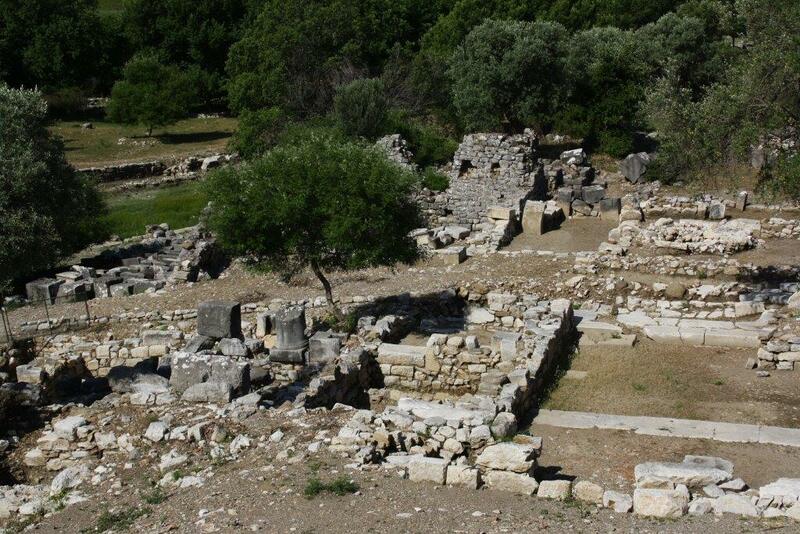 For this reason during the Byzantine period the surroundings of the e churches of Caunos became the new burial grounds. 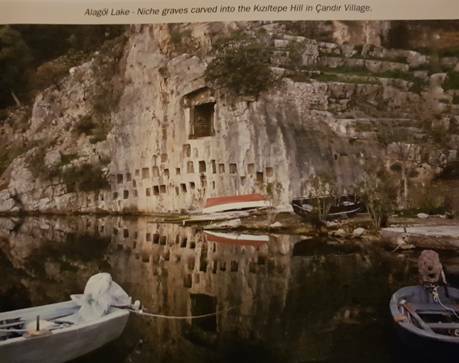 The cemetery of the Municipality of Dalyan is on the other shore of the Calbis river… The dead taken across on boat and the rock tombs lining the cliff over the graveyard appears as a continuation of the customs of antiquity. Similarly, according to myth that explains the separation of life and death, one must make the crossing of the River Styx by way of Charons’ boat to Hades in order to find peace and a final resting place. 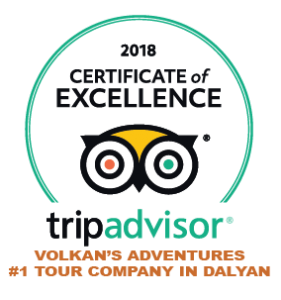 Visitors coming to Dalyan for the first time fall under a sort of spell of enchantment when taking in the captivating and unforgettable sight of the six rock tombs carved into the limestone cliffs on the other shore of the river. These monumental tombs that almost turn into a painting under the yellow light of the spotlights are like doors to antiquity, in which civilisation was elevated with reason and artistic creation and opens into eternity by uniting death and immortality. The actual number of graves is more than meets the eye. There used to be 167 rock tombs built between the 4th – 2nd centuries BC on the promontory of the Balıklar Mountain that surrounds the north of the former North Cove’s steep cliffs. Most of the tombs are grouped into seven different areas of varying heights and are of the pigeon hole and niche variety. 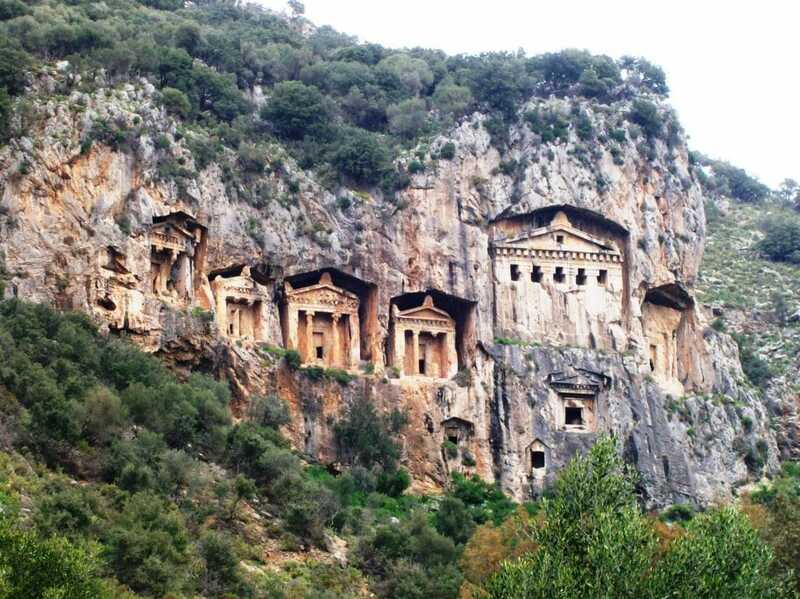 However the most important ones in terms of archaeology well as the most interesting ones to look at, are the temple-faced rock tombs dating back to the 4th century BC. In all of the temple-faced rock tombs and in some of the other types, the peripheries of the tomb chambers re dug out to form a corridor between the rock and the tomb, and the same was done for the roof too, which makes the tombs connected to the rock only. This practice, which gives the grave the appearance as if it is exhibited in a niche, but also required a lot of consruct, is strictly specific to Caunos and to its immediate sphere of influence. The front façade of the temple-faced rock tombs is arranged in imitation of an inantis-planned Hellenistic temple with two Ionian columns between the antes and above these, a triangular pediment, an architrave ornamented with tooth friezes, and palm-leafed terions (placed at the two edges and upper centre of the pediment). The pediments are generally not ornamented. However, one pediment features two lion figures facing each other as well as a bird and a mythological creature at the pointed corners. 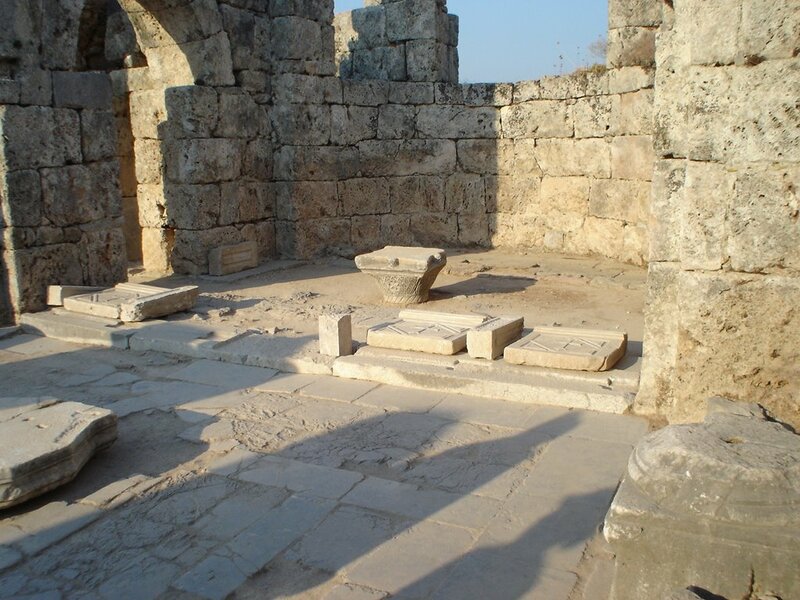 Three divan platforms on the side and rear walls of the tomb chambers indicate that they were used for more than one burial, that is, they were family tombs. No doubt the entrances of all tomb chambers were covered with stone plates carved to appear like four-panel doors, unfortunately only few of these have survived. Only a very few of the tombs have inscriptions. While one of these contains two words in the Carian language, the others are not of Carian origin (Bean-2000). 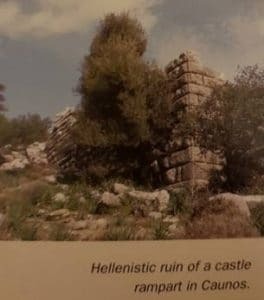 This is connected with the fact that Caunos started to become influenced by Hellenistic culture during the reign of Mausolus as well as with the fact that rock tombs were used in the Roman era. 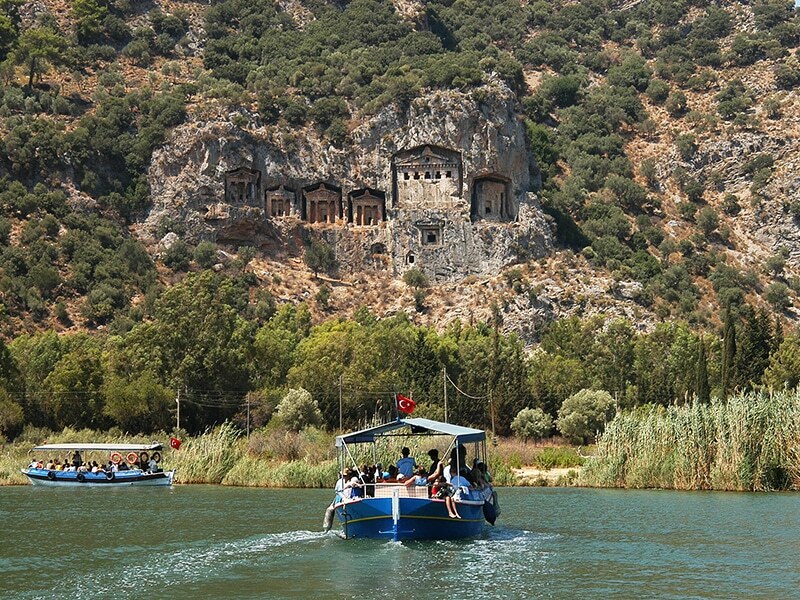 The largest of the rock tombs is located within the group situated across the town of Dalyan. The grave which was planned as a four-column grave but was probably left unfinished at the beginning stage due to the political and economic chaos caused by Alexander’s invasion of Halicarnassus and Caria, provides information on the working methods of the stonemasons of the time. The stonemasons that smoothed the rock surface using scaffoldings completed the roof, pediment and acrators, but after forming the upper parts of the column bodies and the capitals as drafts, the work was suddenly stopped.